These spaces force you to navigate them by car because of how spread out they are. Furthermore, a lot of these big box stores close or go out of business very fast, leaving vast vacant acres of asphalt and cavernous empty stores throughout our landscape. 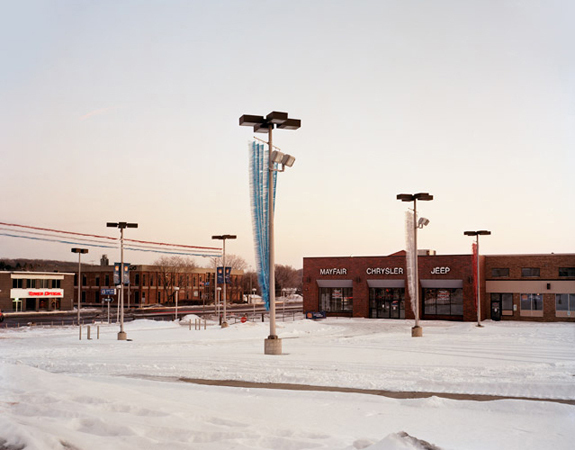 Once I began photographing these spaces I realized how much our landscape is changing. Americans have undergone a paradigm shift in the places where we shop and dwell. We have traded in mom & pop stores and main street for big box stores and highways. Everything is fast, cheap, and easily available, like a fast food value meal. But like a value meal, what’s the true cost?